The good season is coming and so the desire to spend days outdoors: Spring on Lake Garda blooms with different proposals. Winter is almost over: days are longer, the sun starts warming up and the period of out-of-town trips begins. Lake Garda is a wonderful destination all the year round, but Spring is the ideal season to enjoy the colours and the beauty of its landscapes. A quiet walk along the lakeside or to discover the historical centre of one of the many towns of the area is always a good option to spend a day during Spring on Lake Garda. 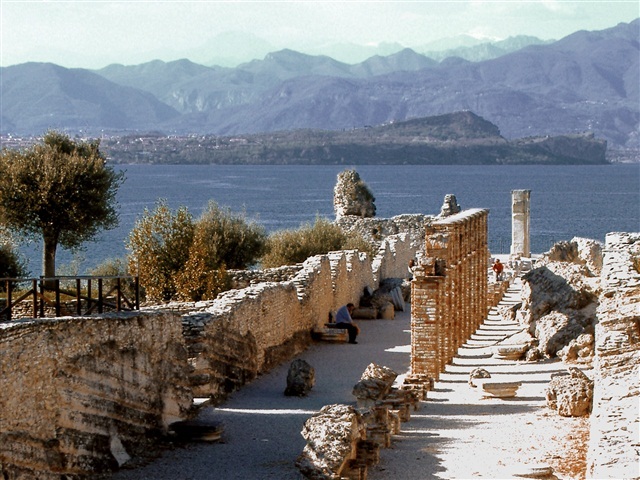 Art and history lovers can’t miss Sirmione and especially the visit to Grotte di Catullo, where there are the remains of the Roman Villa of the latin poet. There are other interesting monuments, for example Vittoriale degli Italiani in Gardone Riviera, Peschiera del Garda Fortress, Rocca of Lonato del Garda and Rocca of Manerba. These places certainly share a breathtaking view of the lake. You can find further suggestions in the article Tourism on Garda Lake: a place of history and natural beauties. Besides outdoor trips which are suitable for any occasion, spring calendar of Lake Garda is full of events in the coming months. The first major event of the new season is Easter: you can find the main events organized for this festivity in the previous article Easter on Lake Garda. However, Spring on Lake Garda will continue with May which will be just as much full of possibilities. May starts with the Labour Day: this is the best opportunity to unplug for a few days, isn’t it? “Primo Maggio Rock Festival” will wait for you at Gino Vaia Park in Leno with live concerts, refreshment areas and stands. Therefore, it will be an opportunity to devote yourself entirely to music and fun. Among the cultural events which will take place in our territory, we suggest you “Parole sull’Acqua” from 24th May to 26th May in Bardolino. With the aim of promoting reading, important writers and journalists will present their latest editorial publications and explore historic and topical subjects. Mountain bike, hiking, trekking, sailing and windsurfing are the main sporting activities which are suitable for spring temperature and lovers of physical activities surrounded by nature. Many itineraries, cycle paths and trails allow you to ease the fatigue with an amazing view of Lake Garda. Don’t miss “Garda by Bike“, a pedestrian cycle path overhanging the lake which will cover the whole perimeter soon. 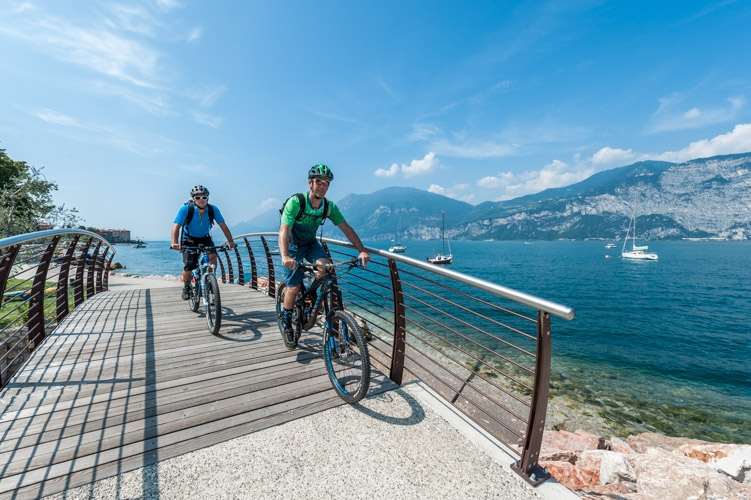 For more competitive bike lovers, the event is from 3rd May to 5th May with the 26th edition of “Bike Festival Garda Trentino” in Riva del Garda with a program full of competitions for participants of any level and activities for visitors too. There will be an expo area with more than 150 exhibitors and 300 brands, the presentation of the news of the bike scene and the possibility of testing and buying new products. If you love golf, Lake Garda is a perfect destination even for you. 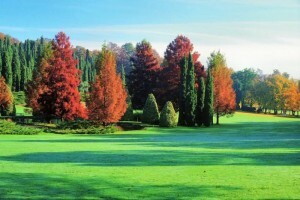 Discover the most beautiful golf courses in our article Holidays on Garda Lake for Golf players. If you love shopping and you visit a town on market day, don’t settle for the shops in the centre, but walk through the stands. The market is a traditional aspect of the territory of Lake Garda and it offers a great variety of products, including typical products of the area. Besides the traditional weekly market, some towns set up antique markets occasionally. Desenzano opens “Un Mondo Vintage” between May and October (Saturday, 4th May 1st and June). In Lonato and Bardolino there’s the opportunity to buy antique pieces on the 3rd Sunday each month. Instead, in Valeggio sul Mincio the event is on the 4th Sunday each month. From 5th May to 13th May, six evocative places on Lake Garda will host the 10th edition of the gastronomic event “Fish&Chef“. During these days, excellent chefs will present excellent products of the territory, including fish, wines, oil and the fine Venetian Garronese meat. From 31st May to 2nd June, Bardolino turns pink with the “Palio del Chiaretto” to celebrate the rosé wine of the same name. Wine tasting will be accompanied by concerts, fireworks displays, music and sporting events which will liven up the old town centre. If you plan a long weekend or a weekend for this Spring on Lake Garda, we invite you to consider Camping delle Rose in Moniga del Garda, directly facing the lake. The wide choice of accommodations, from bungalows and mobile homes to pitches, will satisfy all your needs; together with other facilities, this will guarantee a perfect stay! Easter is coming…haven’t you decided what to do yet? You should definitively spend your Easter on Lake Garda! Here are some ideas for this festivity on Lake Garda. On 21st April Easter will be celebrated, just in time for the season opening of Camping delle Rose! 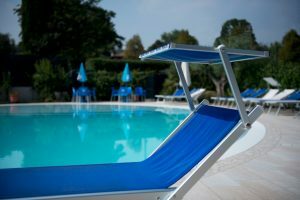 In most areas of Italy, Easter holidays 2019 will be from Thursday, 18th April to Tuesday, 23rd April 2019 so you have to take advantage of it: this is a good reason to spend a day or a long week-end on Lake Garda, isn’t it? Lake Garda is an evocative location in any season of the year. However, the landscape gets full of colours and fragrances with the beginning of Spring and the mild temperature with the first rays of the sun make Easter on Lake Garda unique. This destination is highly recommended for spending Easter holidays in a quiet, relaxing place which also offers a great variety of entertainment events: exhibitions, concerts, food festivals, games for adults and children and much more. During these feast days, both east and west side of Lake Garda will host a large number of events to satisfy every need. All the activities proposed by different towns can be best experienced in the natural and uncontaminated territory of the lake. The enchanting fragrances, bright colours, breathtaking views, meadows in bloom, sunny and mild days create a dream atmosphere: within this landscape, you can only experience unique and unforgettable experiences! On the east side of Lake Garda – Verona side – Easter will be celebrated with local markets and animation. On Lungolago Marconi, Lazise will host a local market with typical goods, artisan craft and much more. At Easter and on Easter Monday, buskers and jugglers will entertain visitors in the town’s squares. 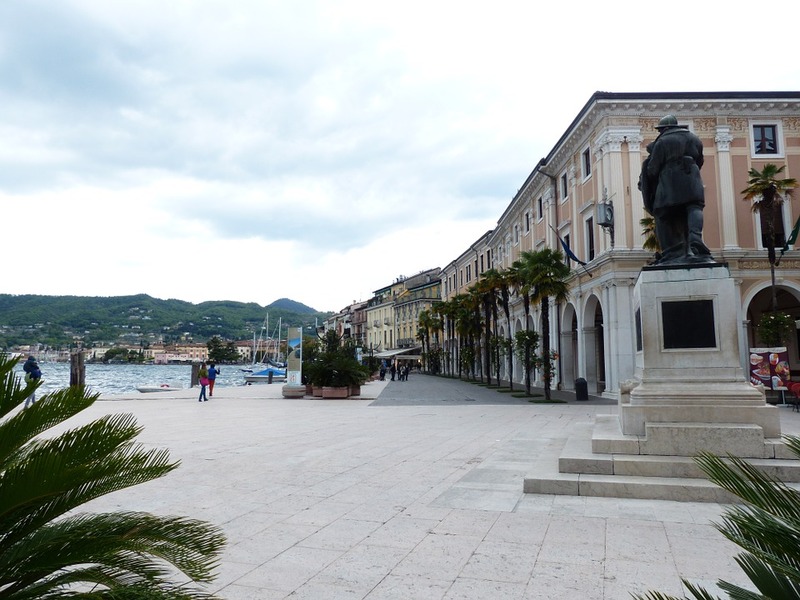 In Garda, the local market named “Progetto Lavanda in Piazza” will take place in Calderini Square selling organic cosmetic and beauty products. In Bardolino, the program to celebrate Easter on Lake Garda is pretty wide. The initiatives organized by this town begin with the event “Noi coloriamo le uova” in Matteotti Square and they will continue in a big way. The heart of the event will be Lungolago Riva Cornicello, with the craft market and the enogastronomic market with traditional products. Moreover, in Porto Square you’ll be able to taste Melegatti Easter bakery products, along with the products of Wine Museum and Oil Museum. Easter will end with the vocal concert of “Bardolino Philharmonic Orchestra” in the Parish Church. On Easter Monday, two events will be organized: starting from 1:00 pm at Lido di Cisano live music and a barbecue will be open to anyone, while at the Stadium there will be inflatables for kids and food stands. 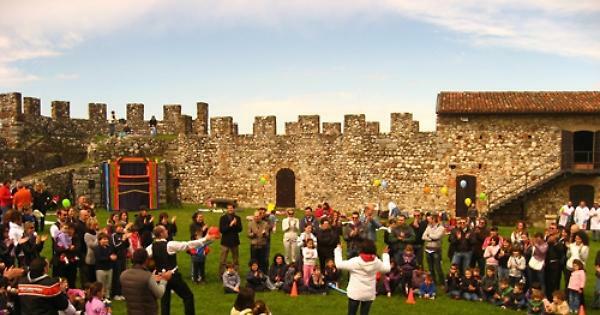 On the west side of Lake Garda – Brescia side – an noteworthy event of Easter on Lake Garda is “Festa di Pasquetta” in the amazing location of the Rocca in Lonato del Garda. The castle will be open for anyone who would like to spend a funny day outdoors: kids will be involved in a botanic treasure hunt, where they will pick up seeds, flowers and plants for the creative activity “Stampa e colora con le piante”, and in a masked egg hunt. On Trento side of Lake Garda, Easter will be full of initiatives. From 19th April to 22 April (from 10:30 am to 9:00 pm) Riva del Garda will host another edition of “Chocomusic, musica per il palato! La grande festa del cioccolato artigianale” in Cesare Battisti Square. It’s dedicated to adults and children because its program is full of events: tasting, cooking show Baby Ciock laboratories. Easter and Easter Monday will be included in this event: chocolate delights and different activities (for example, the creation of the 25 metre long Guinness record chocolate bar then given to the public or the breaking of the giant egg at the end of the event) will be accompanied by different chamber music groups belonging to Corpo Bandistico of Riva del Garda. The entrance is free but courses and laboratories are charged. From 18th April to 21 April (from 9:oo am to 6:00 pm) in Riva del Garda, the sailing club Fraglia Vela Riva will organize the “37th Lake Garda Meeting Optimist“: the event is dedicated to juvenile sailing and especially to Optimist class to launch the competitive season. This sailing event is certified Guinness World Record® as the largest single-class regatta in the world with more than 1055 actual participants. From 12th April to 5th May (from 4:00 pm to 10:30 pm) Arco will host the 47th edition of “Pasqua Musicale Arcense“, the traditional music event with both holy and profane classical music, organized in the main churches of the town. As usually, the shows will take place in the most prestigious buildings, including religious ones. The entrance to all shows is free. 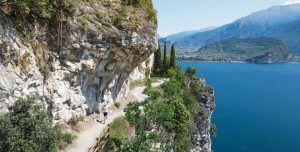 Those who love adventure, sport and hikes can’t miss “Garda by Bike“, a 190 kilometres long cycle path which will circumnavigate Lake Garda soon. 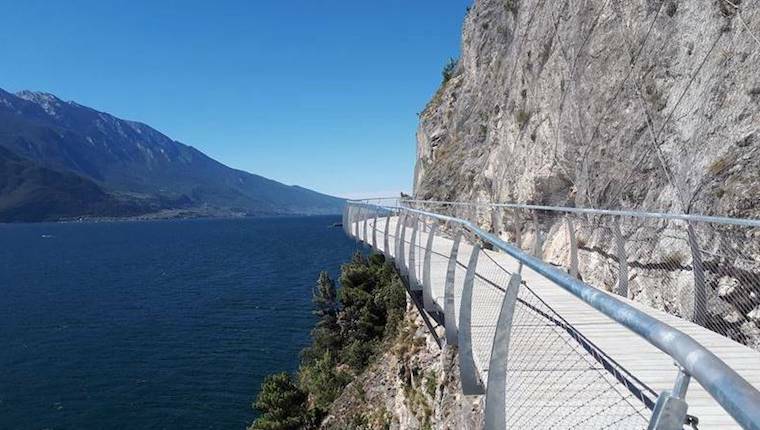 On 14th July 2018, the first stretch of this pedestrian cycle path overhanging the lake which connects Limone sul Garda with Riva del Garda was inaugurated. The route has been called “La Ciclabile dei sogni” because of its beauty as it offers a unique and breathtaking view. Whatever period you decide to come to Lake Garda area, you can move from one area to another using the convenient Crippa NCC transfer service. You can enjoy a precise and punctual service and you can also choose the most suitable car according to your needs. Whatever your choice will be, we wish you a happy Easter on Lake Garda and we invite you to contact us to check the availability of our Camping delle Rose in Moniga del Garda. 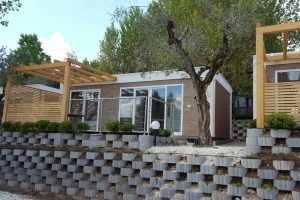 As always, our camping facing Lake Garda provides a wide variety of accommodations, such as bungalows and mobile homes, for a perfect stay and to satisfy every need. After months of work, our camping is ready to open the 2019 season with many surprises for our guests. Salò on Lake Garda: historical and beautiful city. You can visit Museum, Churches and to walk on the lakeside. The Lake Garda is surrounded by many beautiful and rich city. 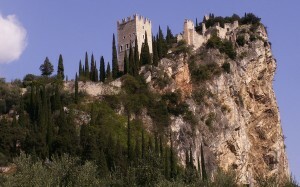 In particular, Salò on Lake Garda is part of Lemon Coast because it’s located on the west coast. This city is a turistic place, thanks to moderate climate and its particulary vegetation. Salò is known for its history: it was the de facto capital of Italian Social Republic of Benito Mussolini (also known as the Republic of Salò), during the Second World War. 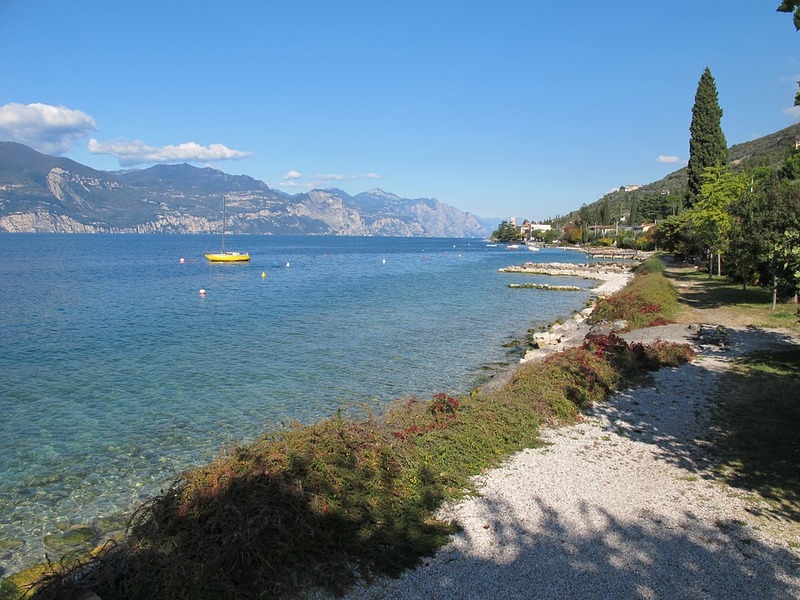 You can visit Salò on Lake Garda and spend the night to the Camping delle Rose. Salò is a jewel of Lake Garda, so you should visit it slowly, because every detail makes this city unique. There are a lot of Structures, Churchs and Palaces that are full of history. So, what can you visit? The Duomo Santa Maria Annunziata is the most important religion monument of the city: this beautiful Church has a Renaissance gate but the facade is unfinished. Into the structure, there are many artworks of Guglielmo Veneziano, Zenon, Veronese and Veneziano. 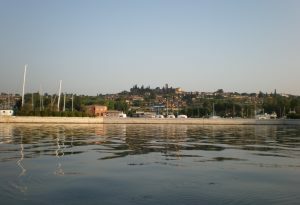 On the lake shore there is the Palace of the Podestà, in the past it was home to the Council of the Magnifcent Homeland, but now it is home of the Municipal. A part of this building it was rebuild because in 1901 a earthquake damaged some areas of city, included the Palace. The Palace Fantoni is of the fourtheenth century and inside has the Library of University of Salò. This library has 25.ooo volumes of the twenthiet century, there are: codexs, incunabolas and documents of Magnificent Homeland. In the Palace there is the Historical Museum and the Military Museum of Nastro Azzuro, that it has documents from Napoleonic era and from the Resistance. Salò is most visited from international tourist. This city offers boat ride to locals characteristic and a long beach where is possible swim. From Salò you can also make beautiful walks by walking or bicycle, track and paths. The lakeshore leads to the square of Vittoria where you can admire the palace of the Magnificent Homeland of Jacopo Sansovino. On the lakeside there are 20 placards that tells the history and origin about the name of the city quarter. This aspect is most fascinanting and a very special way to know Salò, thanks to breath-taking view of Lake Garda. Also, across the lake, there are many cafes and restaurants. Near Salò, th ere are many beautiful cities all to be seen. In Gardone, for example, you can visit the Vittoriale degli Italiani, Gabriele d’Annunzio’s home, and the Hruska botanical garden. 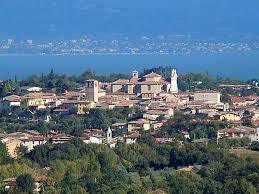 Another city is Moniga del Garda in the southern of Lake Garda. Moniga del Garda produced Chiaretto wine (rose wine), reason why it is also called Chiaretto city. In this city you can spend the night to the Camping delle Rose that is in front of the Lake. The Camping delle Rose offers differents Mobile Homes, Chalet, Bungalows and pitches which you can spend the night. The Camping delle Rose offers a different prices in different periods of the year and also, it offers free access to the following facilities: saltwater swimming pool, broadband Wi-Fi, restaurant and pizzeria with bar, and a wonderful beach. You book on website Camping delle Rose and you will get a discount on the list price for this season. Wine tasting in Moniga del Garda. In June Lake Garda gets pink painted celebrating the 10 years anniversary of rosè wine tasting from all over Italy. Every year the cities around Lake Garda propose wine tasting events: from Chiaretto to Bardolino, from Valpolicella to Amarone, Lugana and Recioto. All these wines are part of Italian’s enological excellence. Spring and summer are the best seasons to taste Italian specialties and to enjoy the beautiful view that this area offers. 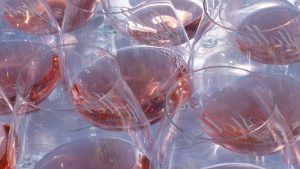 From 2nd to 4th of June there is the “Italia in Rosa” tenth anniversary event of wine-tasting and the city of Moniga del Garda is the main player. Moniga del Garda, also known as the “City of Chiaretto”, is well known for the excellent cousine and the Chiaretto wine. This city is also considered for the good wine and food, as well as for the exhibitions and the events like the renowned “Italia in Rosa”. 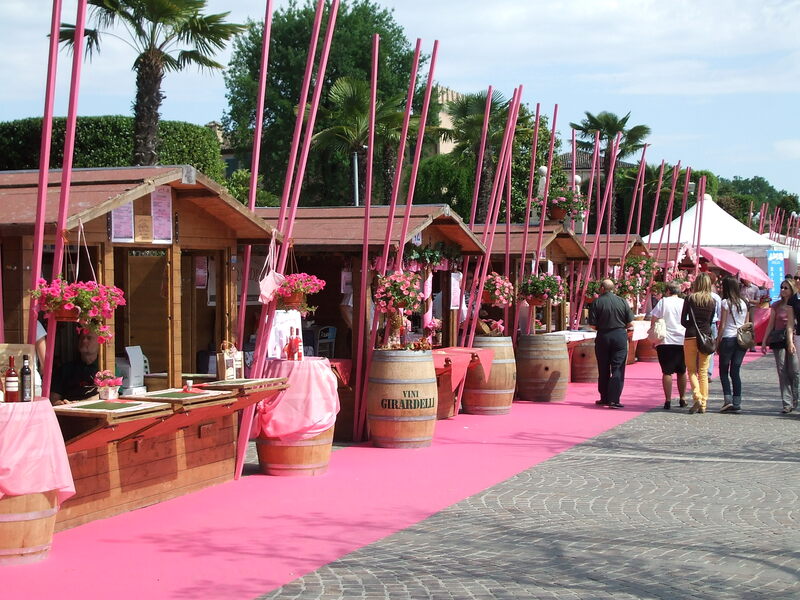 Italia in Rosa is an annual event concerning a wine tasting experience of Chiaretto and Rosè. This festival involves not only the locals but also many wine-lovers from all over Italy. In the last edition were registered more than 6500 attendees. This event is the first and one of the most important festival dedicated to Rosè wines and takes place in the old Castle of Moniga del Garda (XIV Century). For the occasion, the Lake Garda gets pink painted with more than 100 Rosè wines from all over Italy. The wine-producing companies participating at the event will be present in different geographical areas, so visitors can do a complete tour in the Italian’s enology. Some of these geographical areas will include Vignaioli Veneti, Trentino Alto-Adige, Tuscany, Puglia, Sicilia and Sardegna. 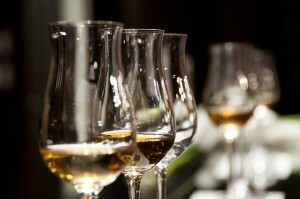 The main national wine-producing companies will offer a full taste itinerary. And, such as in the past editions, this year there will be French wines, in particular from Provence. During the event there will be the possibility to taste more than hundred Rosè wines paying a ticket of 10 Euros. In addiction, for three days from 5 pm to 11.30 pm, you will have the possibility to combine wines and typical dishes. To fully enjoy this festival, at the distance of only 1 km there is our Camping delle Rose, where it is possible to spend the night. Our Camping delle Rose offers Superior Mobile-homes, Chalet and Bungalow in the heart of Moniga del Garda. These accommodations are suitable for every kind of need. The Camping delle Rose directly faces the Lake Garda and please its guests with relax and an enjoyable stay. Addictionally, the Camping offers a salt water pool for kids and adults: this area is also equipped with a relax area and a Jacuzzi. If you want to benefit from a discount off list price you can directly book your vacation on Lake Garda from our website. 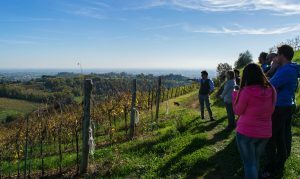 If you are not familiar with the area near Lake Garda, you can be guided by the Crippa NCC transfer service, which offers the possibility of organizing a wine tour. Their highly professional services include the possibility of organizing wine tours, for individuals as well as for groups, in the most characteristic locations of the Lake Garda area. Work is stressing you? Are you looking for a place where you can relax and take a break? Then we suggest you to spend your spring holiday on Lake Garda at Camping delle Rose in Moniga del Garda! In the previous articles we have already suggested our guests with many sport activities and events the Lake Garda can offer during autumn and winter. Now let’s discover what makes Lake Garda an ideal destination to spend your holiday in the springtime. During your spring holiday you will find the perfect mix between sport, delicious and healthy food, and body care. Moreover you will have the opportunity to discover and visit natural beauties and the historical sites of Lake Garda. If you love sports, Lake Garda is the right place for you! In addition to this, spring is the best moment of the year in which you can practise your favourite physical activity, thanks to the mild climate and to the sunny and longer days. There are many routes dedicated to trekking and mountain bike. Ponale Running will take place on 25th of April, a running event along a route that offers breathtaking views. For those who love water and wind there is the possibility to go sailing and windsurfing. Lake Garda is also well known for diving. If you want to live an experience full of adrenaline, you can practise rock climbing, near the village of Arco, or paragliding. Lake Garda is the ideal place to recover your psychological balance and rediscover physical energy, beauty and inner harmony. Villa dei Cedri is a thermal park located in Colà di Lazise. Here you will have the opportunity to take a bath in two lakes of thermal water, immersed in wide lawns and secular trees. Lake Garda, stuck between the Alps and the Po Valley, has very specific characteristics that you can’t find anywhere else in Italy. This especially affects the typical local cuisine and products. In addition to the possibility of tasting the delicious lake fish, Garda area is also known for its extra virgin olive oil and its citrus fruits. The can’t-miss typical dish of Lake Garda is the trout fillet with citrus fruits. Moreover, for wine lovers, there are many routes between the vineyards. If you love art and history, Lake Garda gives you a fascinating travel back in time. The region is full of medieval village protected by walls and towers, venetian and veronese castles. In Gargnano there is the amazing “Villa Bettoni“, one of the most beautiful buildings of the lake, constructed at the end of 17th century. 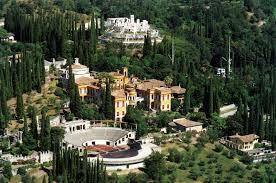 The Vittoriale degli Italiani is the citadel in Gardone Riviera, where Gabriele D’Annunzio arrived in 1921. It is an extraordinary set of buildings, streets, squares, theatres, gardens, parks and watercourses. 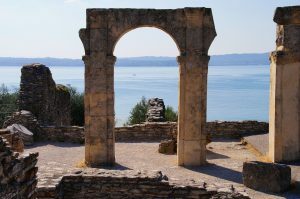 It is also imperative to visit the remains of a Roman villa called “Grotte di Catullo” in Sirmione. There is also an Archaeological Museum inside the park since 1999. At our Camping delle Rose in Moniga del Garda you can find bungalow, suite superior with lake view and mobile homes perfect to fit your needs. Camping delle Rose is equipped with a salt water swimming pool for adults and children. There is also a relax area and Jacuzzi. Discover our special offers for an unforgettable Spring holiday on Lake Garda. Contact us to check for availability and book your accomodation. So if you wanna stay at Campeggio delle Rose and also want to visit these wonderful places, request the Crippa NCC Lake Garda transfer service. You can reach the main attractions of the area with the utmost comfort, through a professional service that can take you from the major airports (Verona, Bergamo, Linate, Malpensa, Venice) to the area of Lake Garda. Days are lengthening, the sun starts to warm our faces and we can smell a scent of spring in the air. What better time to spend Easter 2017 on Lake Garda? Maybe it’s still early but it’s better to prepare in advance if you want to spend mid-April weekend enjoying the beauty of Lake Garda. For this opportunity Camping delle Rose in Moniga del Garda suggests you an inviting offer to spend your holidays benefiting from a spring landscape view. What to do in Easter 2017 on Lake Garda? Like every year Lake Garda coast follows its traditions, giving you days rich of adventures, wellness and breathtaking sunsets for the more romantics. You can discover all the small villages that shine by themselves, making Garda one of the most beautiful lakes of Italy. Moreover you can choose your own entertainment, diving into several activities suitable both for adults and little ones. For this occasion, Gardaland theme park will be open from April 8th with promotions for families and special offers to enjoy all the rides provided. The sportsmen can commit themselves to the most suitable activities for this season, like Mountain Biking, Hiking, Trek, Sailing, Windsurfing and many others. If you prefer tourist holidays, you can choose between many cities with lovely atmosphere. 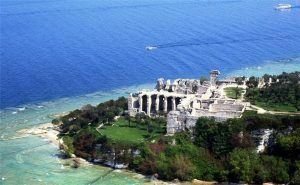 Above all, you can visit Sirmione, where you can find the famous Grotte di Catullo and the Scaliger Castle, historical heritage which must be discovered and admired. So what better time to forget about the stress and the wintry grayness? You can reach the Gardaland Theme Park, the Grotte di Catullo or the Scaligero Castle in a convenient and safe way thanks to the Crippa NCC Lake Garda transfer service. Who has never wanted to wake up to the beautiful view of the lake, maybe drinking a good coffee? Camping delle Rose in Moniga del Garda can give you this unique experience applying a discount on all the available accommodations, in order to offer you a special escape from the city with a breath-taking panorama. Bungalows located in the pine forest are perfect for spend all day outdoor. Camping delle Rose in Moniga del Garda offers also Pitches for those who want to move with caravans. The Camping is only 1 km far from the city centre of Moniga del Garda, which is renowned for excellent cooking and Chiaretto wine and presents a lot of food and wine fairs every year in springtime. Book now to benefit from this special offer and spend your Easter 2017 on Lake Garda! Discover the 2016 Christmas markets on Lake Garda between squares, evocative atmosphere, charming villages and culinary specialties. Wrap yourself in the magic! One of the favorite activities during the holiday season is certainly visit the typical markets which help to make even more magical this festivity. What you may not know is that they were born around 1400, in Germany. The unique products of local craftsmen were bought by the wealthy classes, the only ones who could afford those unique pieces of rare beauty. As time passes the products became accessible to most people, and the markets spreaded throughout Europe. The most famous Christmas markets are located in Cologne and in other major cities of both Germany and France but also in Italy, especially below the Alps, you can find places that are home to traditional markets, now become one of the inevitable appointments during holidays. In the Christmas markets you can find everything from decorations for the tree to cribs but also antiques, souvenirs and local dishes, in addition to the excellent mulled wine, recommended for harsh winter days. On Lake Garda you can find some of the most beautiful and characteristic Christmas markets of the whole Italy. Below we will show you the places where you can appreciate them. In Garda the markets are held from November to January, from Friday to Sunday. Here you can enjoy traditional cribs and taste the local cuisine, sheltered from the cold thanks to the heated marquee. 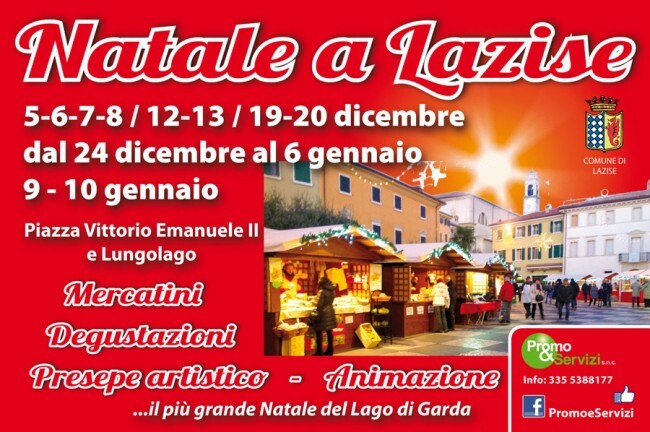 In Lazise the Christmas markets will take place from Saturday, December 5 in the main square where the more than 40 exhibitors will delight you with their products. Furthermore, from 6 to December 8, at the Venetian customs, you can sample dishes with fresh truffles. Here you can visit the markets from November to January in small wooden houses builted for the occasion in the heart of the city. Waiting for you there will be statues and decorations but also household products. If you wish to fully enjoy the magic of Christmas then you can’t not buy the traditional leaders of warm alpaca wool, to wear while enjoying a cup of hot chocolate in your Mobile Home in the Campeggio delle Rose, which will be opened extraordinarily all the winter. Among the favorite destinations on Lake Garda ther is Riva del Garda where, in addition to the markets, you can practice different activities and visit the most beautiful areas of the city, including the castle, the bastion or take the boat to the charming Desenzano or Sirmione , where you can visit the caves of Catullus or relax in the beautiful spa. If this is not enough, there are also markets in Rovereto, Trento and Manerba del Garda. In Trento, the markets will be open every day (except 25) from 19 November 2016 to 6 January 2017 in Piazza Fiera and Piazza Cesare Battisti. Spending your Christmas holidays on Lake Garda is an experience you will not soon forget. By using Crippa NCC Lake Garda transfer service, you can reach all the major christmas markets we spoke about. Their services, punctual, convenient and safe, are ideal for traveling in the area of Lake Garda. What are you waiting for? Visit us at Campeggio delle Rose, and discover our promotions for the winter opening of Campeggio delle Rose in Moniga. Are you planning how to celebrate the Christmas holidays? Below you will find some ideas to make a spectacular New Year’s Eve on Lake Garda! Are you looking for a practical and economical solution, ideal for young and old? Many facilities offer a baby-sitting service during the Christmas dinner, allowing parents to dine in peace, while the kids enjoy theirselves with the funny animation staff. Otherwise, you can stay in the main squares, where every year are proposed entertainment concerts and shows for all the family in the most magical night of the year, in one of the most beautiful areas of Italy. If you are planning a surprise for your children there is only one answer: Gardaland. From the top of the Great Tree magical lights reflect their light on white snow, transforming Gardaland in an enchanting landscape of Lapland. So, what are you waiting for? 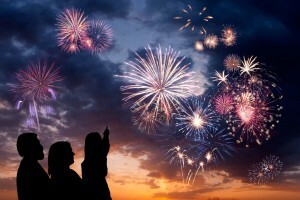 New Year’s Eve on Lake Garda is a great event for the whole family! This year have you decided to celebrate the New Year 2017 with your sweetheart? Here there are some ideas to make the most magical night of the year a fairy tale! 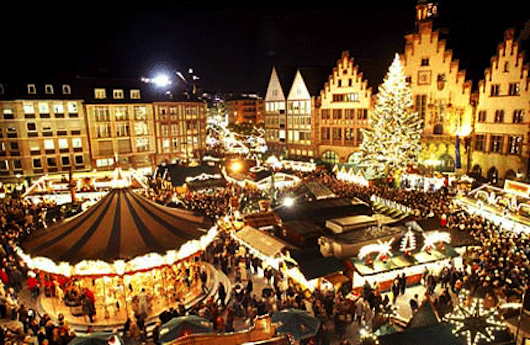 The scent of roasted chestnuts, the Christmas markets and mulled wine will only frame your New Year. Lake Garda offers a lot of possibilities. If you decided to go for a romantic and elegant solution, Sirmione will be your ideal choice: a visit to the medieval castle or Catullo caves, and picturesque lakeside walks are waiting for you! Are you waiting for some relax? Then choose the hot springs of Sirmione, admiring the fireworks that will be reflected in the lake at midnight. If you prefer to venture something different, live an experience with the Parisian flavor, which refers to the majestic capital and its Bateaux Mouches. We are talking about the famous ship “Brenner“, which offers to its three hundred guests an elegant dinner, breathtaking views and an area reserved for the dance, open till 4am. If you are looking for a way to have fun and rock out with your friends on the New Year’s Eve, you have to go to the many beach party or nightclub, specially arranged for the longest night of the year. Internationally acclaimed deejay and music of all kinds, from electronics to smooth, are waiting for you in the coolest clubs of Lake Garda! You will find the best clubs in Desenzano del Garda, with solutions for the dinner and after dinner, with the possibility of reserving the best table in the local area! The Cocobeach of Lonato del Garda seems to be every year the most popular destination of Brescia and Bergamo youth. Do not miss the opportunity to celebrate there! Also at Campeggio delle Rose we are ready to celebrate the New Year! Please do not hesitate to contact us if you want to discover immediately our offers for the winter season 2016/2017. Have you just come back from your holidays but you’re already planning for a last minute escape? Don’t miss the opportunity to live a special weekend on the shores of our magical lake Garda! Below are some tips to realize your dreams’ weekend. Lake Garda, which just few weeks ago was besieged by italian and foreign tourists, will soon reserve his delicate and discreet beauty to those who will be willing to discover it out of the summer season. There will be events and activities aimed at meeting the needs of the whole family! Do you want relax and health? Choose the spa! Don’t miss a relaxing bath in the thermal waters of Colà di Lazise. Lull yourself with the warm waters of the natural pools of Villa dei Cedri. 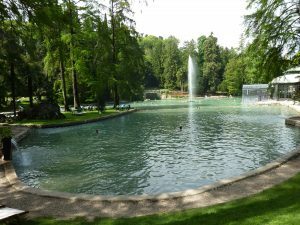 The park is characterized by the presence of two lakes with different thermal conditions in order to offer visitors the chance to bathe at different temperatures. Both lakes are equipped with whirlpools, cervical fountains, waterfalls and geysers. Villa dei Cedri ensures the lighting of the facilities after sunset, to allow guests the night bathing. Wrap yourself with the warm mist to defeat the cool temperatures of autumn. We are proposing an unforgettable day at the most famous theme park in Italy: Gardaland. Each year the park introduces significant innovations. We recommend it to everybody, both to families and teenagers. In fact you can find attractions for all tastes and all ages. Since this year, was promoted the Gardaland Oktoberfest event, which will enrich the atmosphere of the park with the typical flavors of Bavaria from 17 September to 2 October. If you want to celebrate sipping a good beer, do not miss the event of autumn 2016! Lake Garda is embraced by many historic towns, places not to be missed. Only here you can breathe the rustic atmosphere that only a village manages to transmit with authenticity. Below, we suggest a trip out in a must-see location: Bardolino. Dive yourself in the delicate beauty of the historic center, and don’t miss for any reason the Bardolino Castle and the Olive Oil Museum (one of the best local products). 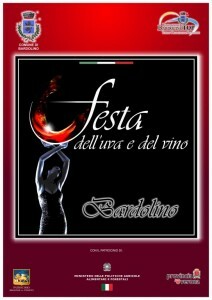 Take advantage of the autumn to take part in the 87th grape and wine Bardolino festival from September 29 to October 3. This is just one of the many events taking place in the Garda coast during the autumn season. Are you athletic? Summer on Lake Garda continues from September onwards. If you like hiking or mountain bikes give yourself a motion day: on Garda itineraries abound from Ponale to Monte Tremalzo. Give yourself a dynamic afternoon along the cycling across the vineyards or take advantage of interesting offers for the excursions of the period. If you are fascinated by the bright colors of autumn, you definitely cannot miss a visit to the enchanting Park Sigurtà. The park was created by the perfect fusion of a historical garden dating back to the 1700s and a modern one, lending itself to being a popular destination not only for botanists, but for all lovers of nature. Park Sigurtà can be visited on foot for a relaxing walk or with the brand new golf carts. If you prefer the movement, the Park offers the possibility of on-site bicycle rental. Spending an autumn weekend on Lake Garda allows anyone to meet their own needs. Take advantage of the upcoming cooler days to find out for yourself all the sights and the many activities that the Garda offers for September and October. Enjoy your last few days of vacation and benefit the convenience of Crippa NCC‘s services. The Crippa NCC Lake Garda transfer service will allow you to enjoy more relaxation before reaching your midpoint. You will therefore enjoy the beautiful view that Lake Garda offers before you reach the main attractions of the area. Visit us at our Campeggio delle Rose and find the best deals that we propose in the autumn. Do not miss the latest availability! For more information, or if you want to know the news for winter 2016/2017, do not hesitate to contact us!